Ahhhh.... It's Springtime in New York. Love is in the air, and on Saturday, April 12th, the weather was perfect for a wedding! Blue skies, sunny and 70 degrees. I loved putting together the Cookie Bar for John and Justin's NYC wedding celebration. For the table design, we wanted to keep it what I started calling "masculine Springtime chic" which meant clean lines with glass apothecary jars and wooden display pieces. The dominant colors for the reception were shades of green, from celadon through moss to hunter, with pops of sunny yellow being provided by the daffodil centerpieces. For the desserts, we kept a neutral palette with yellow French macarons and lemon meringue tarts adding a touch of color. It was a delight to put together a sweets table that both coordinated with their palette and satisfied their palates. The fresh spring air got Dave in the mood for some recipe experimentation. He got the weekend started off right by making us yeasted waffles Saturday morning. They did take a little thinking ahead and prep work Friday evening, but so worth it. The outsides had a delicate crust and the insides had a beautiful earthy flavor. Syrup and butter on top are not really optional. I’ll try and get him to share the recipe here on our blog. Sure, I know Melissa Clark. We go way back. Well, I guess I only know people that know Melissa Clark. We've never officially met, but I've been reading her Times’ articles for years. I’m sure we’d be fast friends… Am I too much like some geeky 8th grader who claims to know a popular girl in 9th grade? Maybe, but that’s because; a) I’m a geek, and b) she’s a popular girl. Regardless, she’s a great writer and her recipes are spot on. Basically, she’s righteous. So, when I read about cultured butter in the March issue of Food and Wine, it reminded me about how inspired I was by the article Melissa wrote in the Times last year. In the One Girl kitchen we make cultured butter with a simple recipe of cream, home-made yogurt, and a little sea salt. We serve it with biscuits and scones for breakfast. Me, I don’t need any excuse for eating a biscuit. If I did it would be cultured butter. This stuff is so good that we recently had to limit the bakers’ butter intake because we were going through too much before it even made it to the café. We started making cultured butter a couple of years ago, but all that time I just thought it was butter. I got the recipe, word of mouth, from a bookstore owner in Portland, Maine. “Sneak some yogurt into the cream and let it sit overnight before you make the butter” she said. So I did, and it worked. I was shocked. But I never really thought much about the ‘cultured’ part of it. I just sort of figured it was a clever little butter trick. I had no idea it was a special ‘thing,’ until Melissa helped me figure it all out. Back in October of 2013 she wrote a great article on cultured butter. She also did a video with Florence Fabricant, who happens to be a righteous lady herself. Thanks to that piece, I realized that what we had been making all this time was cultured butter. Basically, you need to add a tangy element to the cream before you churn the butter. Cultured butter has a deeper, more intense flavor and a creamier texture than plain butter. It’s just better, plain and simple. Cultured butter has been around for ages, (Wikipedia told me so) but lately has been coming back in fashion. So, for those of you who like butter and want to be on the cutting edge of breakfast foods, I urge you to make some at home. It is easy and intensely satisfying. You could even go to a nice cheese shop and get some fancy stuff for yourself. And just in case you can’t find your own cultured butter by tomorrow morning, come to One Girl for breakfast. As for my new friend, Melissa; stop on by the kitchen when you can. I’m working on a recipe for home-made almond milk to use when I make some of your chia-seed breakfast pudding. The biscuits and butter are on me! A walk through Brooklyn based artist Mimms Cross’ apartment might include graffiti on her living room wall, floor or even on mirrors. And it’d be some of the most beautiful handwriting you’ve ever seen. Mimms recently completed the new menu board at our One Girl Cookies Cobble Hill location, and her work has been earning raves from customers and staff alike. Even the occasional stomach grumble. Born into a family of artists, Mimms has loved lettering ever since she was a kid, letting her brother judge her writing in reality show inspired contests and wondering later in school - as she was having a blast simply writing an assignment - whether she could ever make a living at doing just that. It turns out she can. Mimms first met OGC owner Dawn Casale while lettering for graphic design firm Regas Studio where she was encouraged by founder Meredith Kurosko to pursue her love for calligraphy. With Dawn, their conversation quickly turned to shared passions of shapes, precision and beauty. Not long after, they began discussing the new menu board. “So many people asked me if I was painting it with chocolate,” she says of the menu which honestly, really does look like chocolate, and I see it every day as manager of the shop. The gold lettering she created is one of her favorite hands, which she meticulously drew freehand using only a yard stick and level as her guide after laying it out for proofing with an assist from Lindsay Calhoun. Drop by One Girl Cookies 68 Dean Street to check out Mimms’ work, and head over to her site at www.mimmscross.com to see more of what she’s up to. It was a fun filled week with much of the excitement centered around Camille’s Christening. Anyone that knows me knows that I love to host a party. And even though this one did not take place at home (but at this fabulous restaurant in Westchester… www.fortinapizza.com) there were lots of details to attend to. I mean, what’s a party without the details…. ~ And every single party needs a knock out dessert table! But of course, the real key to a great party is a stunning guest of honor…wearing sequined bloomers! As we plan the summer wine selection at One Girl Cookies DUMBO, Winebow invited us to their Pink Up! event at Corkbuzz to sample their Rose selection this year. As someone who usually veers away from Rose, I was eager to join in on the tasting to see what the fuss is all about! I can definitely say now I feel differently about the wine! Joel and I were lucky to be accompanied by our Winebow rep Chris Roberts, otherwise we would not have known where to begin! Since we are neighbors to the Brooklyn Bridge Park in DUMBO, we tend to get a lot of customers craving a crisp and refreshing drink during the hotter seasons after spending a day outside and having a nice glass of rosé seems to remedy that quite well! At One Girl, we try to stick to a certain light & tasty flavor that tends to stem from Italy or France. Although we were given an abundance of choices, Joel and I were able to single out a few of the tastiest. Since the sun is coming out more and more, come by and have a glass with some cheese and crackers! Zardetto Rose, from Italy, with crisp aromas of cherry and red currant, light acidity and a velvety-smooth finish. The color of this rose resembled a raspberry, which automatically takes you to summer. Fleury Rose Brut, from France, a delightful combination of strawberries and forest air; small, smooth bubbles with great texture. Lanson Brut Rose, from France, this was a pleasant mixture of Pinot Noir (53%), Chardonnay (32%), and Pinot Meunier (15%); initial taste is gentle and filled with berries leading to a long-lasting finish. And finally, for still rose, another great wine to pair with our cheese plate and spicy nuts; or if you want to follow in Dawn's footsteps, a great wine to pair with chocolate (example: our Juliette cookie, or a chocolate whoopie pie). Les Pallieres Gigondas Au Petit Bonheur, a Grenache, Syrah, Cinsault, Clairett blend that hails from France; these grapes are pressed straight after picking and matured in wood. This process yields a crisp wine with a brilliant appearance. Les Vignobles Gueissard Cotes de Provence Rosé "Les Papilles", a blend of Mourvedre, Syrah, Cinsault, Grenache, Cabernet-Sauvignon, Rolle; this wine is also from France and has rich, aromatic hints of wild strawberries and raspberries. Vitiano Rosato, a blend of Merlot, Sangiovese, Cabernet Sauvignon, and Aleatico; this wine is from the Umbrai region in Italy; it is dry, medium-bodied, with clean aromas of strawberries, plums and cranberries. I never imagined there were so many different flavors, textures, and colors of Rose. It is such a simple wine, which pairs so well with a summer picnic or barbeque, and yet the wine itself is quite complex and versatile. Probably a wine I would usually skip over, now I'm more eager to test more bottles this summer! The final birthday celebration of the month happened last Sunday. It was for my brother in law, Dax, who embraced 40 with open arms…well, sort of. We had a family gathering which, as always consisted of all the nieces and nephews assisting in blowing out the candles. Not at all chaotic! Since it was a first for Camille, she even got in on the action. The start of April caused the flick of a switch which brought new ideas, trials in the kitchen (stay tuned for new breakfast items, donut day and plenty of other surprises), and a revived team ready to put winter behind them and focus on a new season. These lovely “Little Shop of Cakes” were just one result. “What’s Up Doc?” pairs chai spiced carrot cake with white chocolate buttercream and “Ebony & Ivory” features marble cake with hazelnut ganache and mocha Swiss buttercream. If these cakes are any indication, spring is going to be one fantastic season. A new and long overdue menu board at our Dean St shop continues with the fresh and new theme. For months we have been trying to come up just the right way to display a menu of our offerings. We were looking for something sort of modern that fit into our vintage-y jewel box of a store. But, it also had to be easy to read and have a handmade feel, just like the sweets we sell. We found the answer in Mimms Cross who painstakingly hand painted the most lovely menu for us. I find myself stepping into the café just to admire it. Here’s a photo but come in and see it in person. I assure you, it will make you want to order one of everything! The signs of spring are abundant. Whether it’s those first crocuses bursting through the leaves, the buds on a tree struggling to open, or eating an ice cream cone in the sun, they never fail to generate lots of excitement. It happens every year, but somehow it never gets old. Our neighborhood is so awesome. Having a BID would make it that much better for residents, visitors and business owners alike. Please support One Girl Cookies and our neighbors in an effort to bring a BID to Smith and Court Streets. Both small (and large!) donations as well as the completion of the survey are greatly appreciated. There is a group of Court Street & Smith Street merchants working with property owners to put forth a BID (Business Improvement District) for both Court Street & Smith Street! A BID will strengthen the very core of our shopping/dining district along both Court & Smith Streets as well as provide an enormous amount of services and programs to support our community. It will also help preserve the mom-and-pop, individually-owned, small-business-model backdrop that has helped make this area so popular to live in... or even to open that small business you have long dreamt about. We don’t want these types of shops to be a thing of the past. Isn't it time we had a BID?! This was a rough winter for many of us and with rents soaring overnight our district of mom and pops needs stability in order to survive. When our leases come up, wouldn’t you like us to renew? We are asking for you support in two ways. First, please fill out this survey. The more information we have about the needs of merchants and residents the more quickly we can prioritize and address them. Your voice matters! Second, be vocal with your support of this BID through all social media channels. Get your friends and family on board and help spread the word in support of this BID. Once a BID is approved by the City Council, commercial property owners from Court & Smith Streets will fund it through a simple annual easement, but in the meantime we could also benefit from your help now to cover campaign costs including mailings, flyers, meeting notifications, etc. One dollar is the requested contribution but feel free to give up to $5 or more! You can throw down here. Your contribution shows your commitment to your community, THANK YOU!! The history of New York is one of change that we see and feel every day right here in Brooklyn. Let’s make a difference by strengthening the very core of our district of business and provide future generations the ability to walk into a unified and sustainable shopping area. LIKE US ON FACEBOOK and visit us on the web. If you remember our "Happy Hour Holiday Collection" from December, it may not surprise you that some of us at One Girl love a cocktail in our desserts. That is why our first "Dessert Trend" blog post is dedicated to some great boozy desserts out there, and two even include my personal favorite aperitif: Fernet Branca. I love the black liquorice flavor of the liquor and it's power to soothe even the fullest of stomachs! I'm not sure when I first noticed this trend of incorporating a drink into a dessert, but I think it's something that's going to stick around. Maybe, as inexhaustibly busy New Yorkers, we enjoy food that combines our needs into one delicious bite: a drink, something sweet, and something satisfying. The food scene in New York City is ever-changing, always seeking the Next Big Thing, and the ingredients are always daring and inventive. There are so many food trends, advances, and experiments; boozy desserts are certainly one of my favorites. 1. 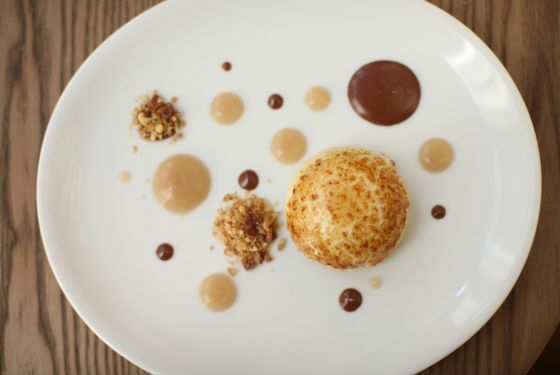 All'onda (22 E 13th St, New York, NY): Fernet Branca semifreddo topped with fennel moustarda. 2. 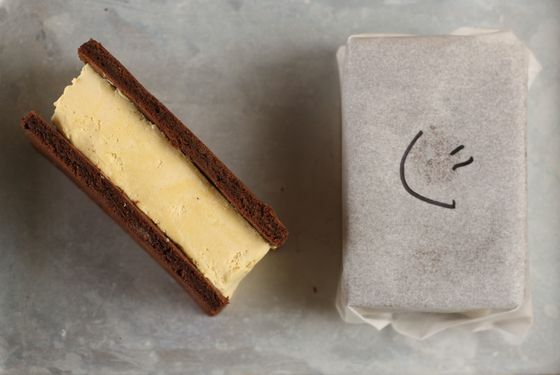 Pearl and Ash (220 Bower, New York, NY): Fernet Branca ice cream sandwich. 3. The Gander (15 W 18th St, New York, NY): Creme brulee semifreddo with anise milk chocolate, walnuts, bacon, and whiskey. Who needs a cocktail and first course when you can have this dessert? 4. Battersby (225 Smith St, Brooklyn): Black and Tan souffle. The month of March was filled with birthday celebrations galore! The week began with a 40th birthday celebration for my cousin Lisa. A traditional homespun carrot cake, replete with multi-color spiral candles, is so nostalgic. From our cookbook, of course! Birthday celebration #2 was another four decade celebration with four friends. Dinner at Dover was stellar. Cheesecake mousse with pear sorbet was the proverbial icing on the cake. It may not appear so, but amidst all of the celebrating and feasting, I did actually get some work done! Check out these photos of a potential new home for the One Girl Cookies kitchen. Top secret for now but I’ll let the cat out of the bag soon…pretty exciting stuff! We brought our dream team in (designer, general contractor, kitchen consultants and mechanical engineer) to start the brainstorming process. Lunch with my oldest (like, since kindergarten) friend was a lucky surprise. We went to one of my favorite neighborhood spots (and not just because it’s a stone’s throw from my house). 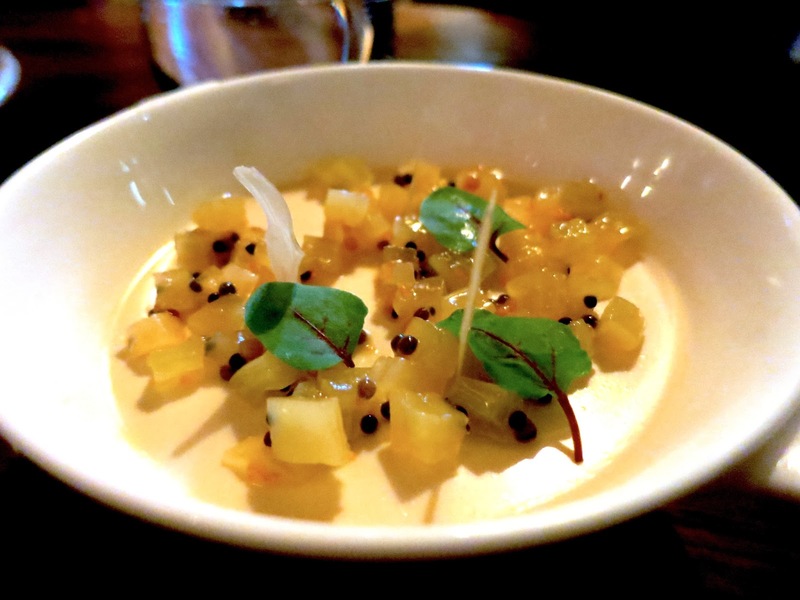 The food at Rucola is always as beautiful to look at as it is to eat. This roasted carrot salad with Beluga lentils and goat cheese is my go to for lunch. That was followed by an afternoon of turning the crank on my pasta machine (such a Zen process, in my opinion) for dinner for Dave’s cousin and sister. Tossed it with shrimp, roasted tomatoes and mixed greens plus a simple salad and we called it a meal. I am hoping that next week’s “Lately” will be filled with many tales of outdoor adventures as it is finally warming up here in the Northeast. At least that is what the little dove who built a nest in the cherry tree outside our window tells me.